This Assassin’s Creed Syndicate collectible guide will show you the locations of all the Secrets of London Music Boxes, Beer Bottles, Pressed Flowers, Historical Poster Illustrations and Royal Correspondences. The Helix Glitches, Letters from the Front and both white and gold chests are not required for any of the trophies in Assassin’s Creed Syndicate. Assassin’s Creed Syndicate has 32 Secrets of London, 20, Beer Bottles, 30 Pressed Flowers, 50 Illustrations & 12 Royal Letters. The Beer Bottles, Pressed Flowers and Historical Poster Illustrations have maps that you can purchase in the game from a shop. This will mark your map with all of their locations. You can also buy maps of all the white and gold chest locations but these aren’t required for any trophies. Total cost of these treasure maps, including the chests will be around 37,000. The Royal Letters and Secrets of London maps can’t be purchased (you can buy Secrets of London maps through micro-transations). Here is a vendor that sells the treasure maps. For the Secrets of London, first go to Reuge’s Vault, which is marked on the map. From there you will be sent off to find 32 Music Boxes and take out the precursor discs inside of them. 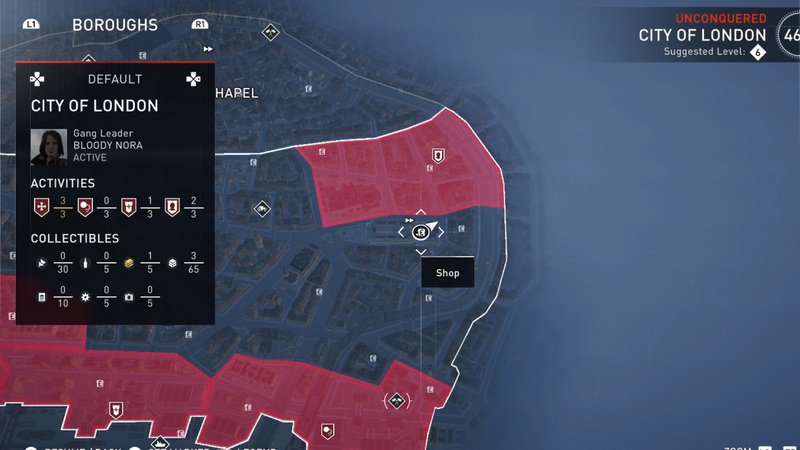 In your progression menu you can access Secrets of London and see a clue of its location through an in game photo. In the following video, you will see maps of each location. Pause the video (make it full screen on YouTube to see it better) for each territory and you’ll see the camera icon indicating the location of the secret. Next to it will be a number and you can use that number to reference the photo from the Secrets of London menu. When you are within 5 meters of it, the icon will show up on your in game map. Within 15 meters, you’ll hear the music box playing. Don’t forget that you can use your Eagle Vision as well to spot them. If you want to see Secrets of London maps in their own post, click here. Here is a video (same one as up top) detailing further the Treasure maps you can purchase for the Beer Bottles, Pressed Flowers and the Illustrations. In the video, there will be a map of all the Royal Correspondence, which are all located near the palace in Westminster. There are no collectibles required for trophies in WWI. With the exception of the Secrets of London, the reward for completing each set are Helix Points. Once you have found all the Secrets of London, you will need to go back to the vault and place them into the pillars and you will then be rewarded with The Aegis Outfit, and you can then craft The Aegis Cape. how many helix points does completing each set give you?